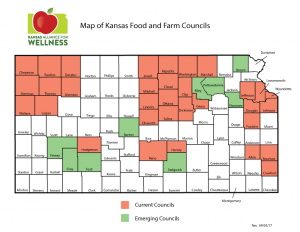 The North Central Kansas Food Council is made up of a diverse group of public and private stakeholders in a collaborative effort to advocate for enhanced quality of life for all residents through sustainable access to regionally produced food options, economic opportunity, and educational resources. The group met for the first time in February 2017 and encompasses all 12 counties in the NCRPC primary service area including Clay, Cloud, Dickinson, Ellsworth, Jewell, Lincoln, Marshall, Mitchell, Ottawa, Republic, Saline, and Washington. The North Central Kansas Food Council 2018 Community Food Survey has closed. Thanks to everyone who participated! Check back for survey results, which will be shared as reports become available. The mission of the Council is to advocate for enhanced quality of life for all residents through sustainable access to regional produced food options, economic opportunity, and educational resources. Assess and prioritize the needs of the local food system. 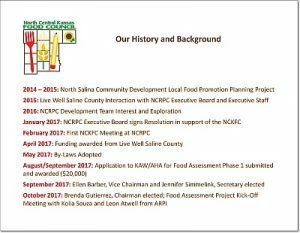 The North Central Kansas Food Council was formed as an initiative of Live Well Saline County and the North Central Regional Planning (NCRPC) and is supported by Advancing Rural Prosperity, Inc. (ARPI) through its joint partnership with the NCRPC to advance food system development in North Central Kansas. Live Well Saline County is dedicated to improving health and wellness for Saline County, Kansas. The NCRPC is committed to advancing rural Kansas through comprehensive planning and development services. ARPI, a major contributor in establishing and growing the regional food system in Northwest Kansas, brings that expertise to the central region of the state. The Council also wishes to acknowledge the assistance of Missty Lechner from the American Heart Association and the Kansas Alliance for Wellness. This map of Kansas Food and Farm Councils is provided courtesy of the Kansas Alliance for Wellness. Click here to view a presentation from the Kansas Rural Center 2017 Food and Farm Conference. For more information, visit the NCK Food Council Facebook page or contact Emily Benedick, NCRPC Community Development Representative.